I have just returned from a delectable culinary trip to New York City with my wonderfully spontaneous friends. 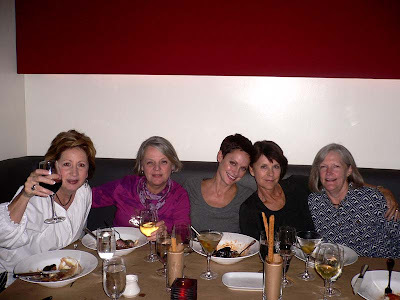 Pictured above from left are, Barbara, Me, Amy (Jackie’s daughter), Jackie, and Karen. We are enjoying dinner at Craft, one of award winning chef Tom Colicchio’s many restaurants. The concept behind Craft is one of simplicity in ingredient pairings to highlight the basic goodness of the dish. My hanger steak with whipped potatoes was delicious. We had a magical first night in the city. It was a warm night and we finished the evening at an outdoor venue (Can’t remember it’s name) where we ate three chocolate desserts. The beignets with chocolate dipping sauce were unbelievable. At Central Park the next day we enjoyed a sunny Saturday. 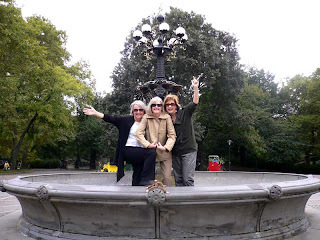 Friends in the famous fountain from Friends. 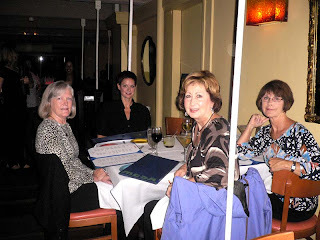 Before seeing The Jersey Boys on Broadway we went to Ayza’s Wine and Chocolate Bar for a light meal and drinks. 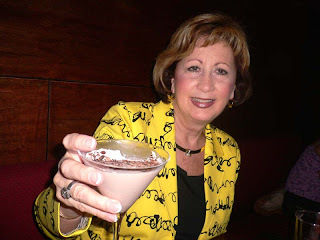 Barbara loved her chocolate martini. Ayza is one of the best wine and chocolate bars in New York City. They serve Jacque Torres Chocolates and have an extensive wine list. Ayza is all about the appetizers. Served with crusty bread, it is easy to feel satisfied. 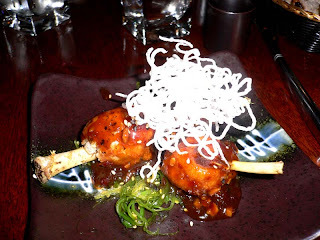 I had Angry chicken lollipops with spicy, sesame, hoisin sauce and crispy rice noodles. The play was absolutely enchanting. We went to Sardi’s afterwards and the highlight of being there was seeing Jude Law leaving the theater across the street after his performance in Hamlet. Yes, I said JUDE LAW! I had commented earlier in the day that I would love to run into a movie star while in New York. The girls asked me which one – I said Jude Law. Dreams can come true. Sunday night we went to Bobby Flay’s Mesa Grill. 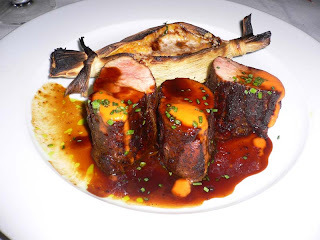 It was the most expensive meal of our trip, but the food and flavors were impeccable and the wait staff and atmosphere at Mesa Grill make it well worth the splurge. I had New Mexican spice rubbed pork tenderloin with bourbon ancho chile sauce served with sweet potato tamale with crushed pecan butter. 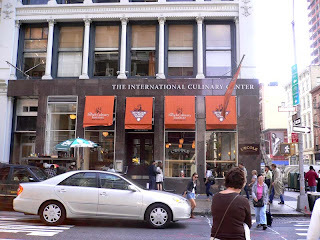 We passed the International Culinary Center one day while shopping. The students serve meals there. 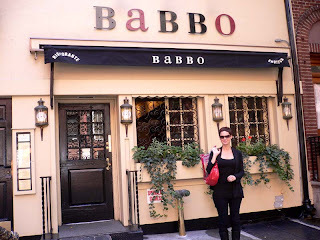 While strolling through Soho we found Babbo, Mario Batali’s famous Italian restaurant. I have eaten there on a previous trip. It is wonderful and expensive. On Monday night we met with Brooke,the daughter of a dear friend of ours, who lives in New York. She took us to Otto Enoteca Pizzeria, Mario’s less expensive pizza and pasta trattoria. My Spaghetti Carbonara was wonderful. 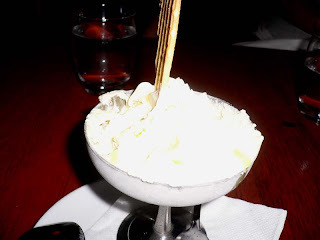 But the star of the evening , recommended by Brooke, was the Olive Oil Gelato. My picture is terrible, but this dessert is amazing. For a better picture and the recipe go to A Beautiful Mosaic, a food blog that I just found. This is not an overly sweet dessert. It is creamy and refreshing with the unexpected addition of fleur de sel. There are so many experiences I have not included here. We had Ethiopian food one day for lunch just for the experience, not a good experience in our opinion. We went to the Today Show and met Ann Curry who talked to everyone on line for over twenty minutes. She is the most gracious and genuine person I have ever encountered. 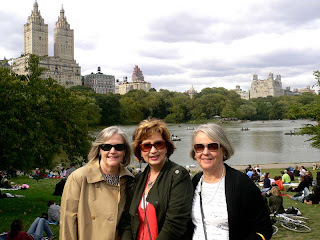 New York is a varied and friendly city and the girls and I had the best of times. Thank you to all of my blogging buddies who offered suggestions. Dave from My Year on the Grill suggested going to Sardi’s after the play and it turned out to be a pivotal experience. He also had suggested visiting Pomaire, a Chilean restaurant with a pri fixe $29.00 menu and The Greenwich Village Food and Culture Walking Tour. Dave knows his New York and I wish we had had more than four days to take it all in. Thank you Kristen for taking care of Lake Lure Cottage Kitchen while I was gone. I left it in your good hands and can hardly wait to try your recipes. Posted on September 30, 2009 at 8:37 am.